Li, H., Song, X., Liu, X., Li, C., Xu, J., Qu, M., Wu, Z., Cheng, X., and Xiao, C. (2014). "The human physiological response to volatiles from Juniperus chinensis cv. Kaizuka and Pistachia chinensis Bunge," BioRes. 9(4), 6669-6681. Effects of volatiles from Pistacia chinensis Bunge and Juniperus chinensis cv. Kaizuka on human emotions were investigated. The volatiles were analyzed using a gas chromatograph-mass spectrometer (GC-MS). Human emotions were defined and measured using several physiological indices, including oxygen saturation of blood (OSB), finger temperature (FT), pulmonary ventilation volume (PVV), and electrocardiograph (ECG). These indices were measured using a multi-conductive physiology technique. The results showed that after participants had inhaled volatiles from P. chinensis Bunge, their OSB and FT decreased significantly (P＜0.05) in comparison to the control group, while the PVV increased. After inhaling the volatiles from J. chinensis cv. Kaizuka, the OSB and FT increased, while the PVV decreased. In addition, women’s FT and PVV and men’s OSB and PVV differed significantly from those of the control group (P＜0.05). Some ECG indices were also affected by the inhalation of volatiles. These results indicated that people tend to feel more excited or nervous when in the presence of P. chinensis Bunge, and more relaxed and comfortable while in the presence of J. chinensis cv. Kaizuka. Effects of volatiles from Pistacia chinensis Bunge and Juniperus chinensis cv. Kaizuka on human emotions were investigated. The volatiles were analyzed using a gas chromatograph-mass spectrometer (GC-MS). Human emotions were defined and measured using several physiological indices, including oxygen saturation of blood (OSB), finger temperature (FT), pulmonary ventilation volume(PVV), and electrocardiograph (ECG). These indices were measured using a multi-conductive physiology technique. The results showed that after participants had inhaled volatiles from P. chinensis Bunge, their OSB and FT decreased significantly (P＜0.05) in comparison to the control group, while the PVV increased. After inhaling the volatiles from J. chinensis cv. Kaizuka, the OSB and FT increased, while the PVV decreased. In addition, women’s FT and PVV and men’s OSB and PVV differed significantly from those of the control group (P＜0.05). Some ECG indices were also affected by the inhalation of volatiles. These results indicated that people tend to feel more excited or nervous when in the presence of P. chinensis Bunge, and more relaxed and comfortable while in the presence of J. chinensis cv. Kaizuka. With the ongoing social and economic developments in China, the quality of the living environment is decreasing. Forest habitats are playing an increasingly important role in improving the quality of the living environment. However, in many cases, the development of forest habitats has focused exclusively on old-style visual beauty and ignored the influences of those tree species on the physiology and psychology of their inhabitants. Human emotional responses can be detected and recorded over time by monitoring the changes in some common physiological indices (Zhang et al. 2003; Lou et al. 2005; Yan et al. 2005; Wang et al.2010; Qie et al. 2011). For example, increased finger temperature (FT) and oxygen saturation of blood (OSB) and decreased heart rate can result from a stable emotional state, relaxation, or an energized state (Fang et al. 2010; Qie et al. 2011). Meanwhile, nervousness and excitation consistently leads to decreased FT, decreased OSB, and increased heart rate (Zhang et al. 2003; Wang et al. 2010). The changes in these physiological indices are closely related to the surrounding environment, especially the presence of extraneous irritants (Angioy et al. 2003). It was recently reported that some secondary metabolic products, i.e., volatiles from some woody plants, can affect human physiology and psychology when absorbed into the body via the respiratory system or percutaneous penetration (Buchbauer 1996; Guba 2000; Heuberger et al. 2001; Wang et al.2013). For example, certain terpene compounds from the volatiles of some plants can induce feelings of relaxation and comfort, while benzene and benzene series can result in headaches, dizziness, and trances (Kazuhiko 2000; Kumie 2000; Seiichi 2000; Yatagai 2000; Ilmberger et al. 2001; Zhang et al. 2003b; Wang et al. 2010). Therefore, by selecting and planting trees that release known positive volatiles, more psychologically and physiologically pleasant living places can be created. Because this research topic stands to benefit society as well as people’s lives, it is worthy of being studied. The release of volatiles from some common tree species has been investigated and reported in the past (Lee et al. 2002; Ho et al. 2004; Cui et al. 2006; Liang and Yang 2010; Schollert et al. 2014). However, their effects on physiology and psychology were seldom reported in earlier studies. The objective of this research was to investigate the effects of the volatiles from two common tree species (P. chinensis Bunge and J. chinensis cv. Kaizuka) on human physiology and psychology to provide scientific guidance for the proper selection and configuration of trees near living places. Leaves, which were used as the test samples, were obtained from specimens of P. chinensis Bunge and Juniperus chinensis cv. Kaizuka planted on the campus of Shandong Agricultural University (SDAU), Taian China. P. chinensis was about 11.2 m in height and 24.5 cm in diameter at breast height (DBH), and J. chinensis cv. Kaizuka was about 4.8 m in height and 8.3 cm in DBH. Leaves facing the sun were selected and picked in the middle of June. A total of 120 freshmen and sophomore students at SDAU, 50% male and 50% female, were selected as test subjects. The average age, average weight, and average height of these students were 20.2±1.6 years, 60.4±12.3 kg, and 163.5±8.3 cm, respectively. The testing machine was an eight-channel PowerLab system (AD Instruments, Australia). This system was based on a Windows operating system and was designed to collect and analyze physiological data for OSB, FT, pulmonary ventilation volume (PVV), and electrocardiograph (ECG). The changes in the physiological indices of the participants, when subjected to stimulation, were monitored and recorded by the multi-conductive physiological testing technology. Three inhalation rooms (Nos. 1, 2, and 3), one preparation room, and one testing room, each of the same size (8.0 m × 6.8 m × 3.2 m), were used for this study. The rooms were kept clean, calm, and at temperatures of 24±1 °C. Inhalation room No. 1, which contained no traces of either tree species, was used as the control room. Leaves of P. chinensis and J. chinensis cv. Kaizuka were shredded into sizes of 0.5 by 0.5 cm and sprayed uniformly on the floors of inhalation rooms Nos. 2 and 3 at a rate of 10 g/m2 in both cases. The 120 human participants were divided into 3 groups, with 20 male and 20 female participants in each group. The test was finished in 7 days, with 18 participants (6 participants from each group, with 3 male and 3 female participants in each group) each day in the first 6 days and 12 participants (4 participants from each group, with 2 male and 2 female participants in each group) in the 7th day. The tests were conducted in the morning of each day from 8:00 am to 10:30 am. Each day before testing, the participants were numbered from 1 to 18 (from 1 to 12 for the 7th day) and were allowed to enter the rooms one after another according to this order. For example, as shown in Fig. 1, the No. 1 participant first waited in the preparation room for 30 min, and then entered the testing room immediately, where the pre-experimental physiological indices were measured (3 min to complete the measurements). Next, the No. 1 participant entered the designated inhalation room, where he or she sat quietly without talking or reading for 1 h. After 1 h, the No. 1 participant returned to the testing room immediately for the post-experimental measurements of the same physiological indices (3 min to complete the measurements). All the measurements were taken in the same order, and were previously described in a report (Wang et al. 2010). The total time for each participant to complete the test was about 96 min. Three minutes after the No. 1 participant entered the preparation room, the No. 2 participant started to enter the preparation room and followed the same test schedule as that of the No. 1 participant. The main physiological indices measured in this research included OSB, FT, PVV, and ECG. This research was approved by the Institutional Review Boards (IRB) of Shandong Agricultural University and Shandong Research Institute of Forestry. A solid-phase microextraction (SPME) method was used to extract the volatiles from the tree leaves. In each analysis, 10 g of fresh and functional leaves were weighed, cut into pieces 0.5 cm by 0.5 cm, and placed into a 100-mL extraction flask sealed with aluminum foil. The extraction was conducted at 40 °C using Stableflex SPME tips (Supelco, Bellefonte, PA, USA) of 50/30 μm Divinylbenzene/Carboxen/ Polydimethylsiloxane (DVB/CAR/PDMS). Then, the tips were inserted into the injection port of a gas chromatograph-mass spectrometer (GC-MS) and desorbed at 250 °C for 3 min. Three replicates were made for each of the two tree species. The major volatile constituents were identified using a GC coupled to a MS (GC-MS-QP 2010 plus; Shimadzu, Japan), and each component was quantitatively analyzed. The GC oven was programmed for 2 min at 35 °C, followed by a temperature increase at the rate of 6 °C/min to 100 °C, then by an increase at 8 °C/min to 140 °C, and finally by an increase at 12 °C/min to 250 °C, at which it was maintained for 3 min. The mass spectra of the eluting compounds were generated at 70 eV and recorded each second (m/z 35 to 450). The ion source was electron impact (EI), which had a temperature of 200 °C and an interface temperature of 230 °C. The volatile compounds were identified by using the National Institute of Standards and Technology (NIST) MS search software (Gaithersburg, MD, USA) NIST08 and NIST08S and screening their built-in libraries for comparable mass spectra and via comparison with authentic reference compounds. The relative percentages of the compounds were calculated using the area of the peak normalization method. The software programs Statistical Program for the Social Sciences (SPSS, Chicago, IL, USA) and Microsoft® Excel 2003 for Windows were used for a one-way analysis of variance (ANOVA). A least significant difference (LSD) method was used for statistical evaluations, and the differences between the different treatments were examined for significance at the 5% level. As shown in Table 1, eight volatile compounds of P. chinensis Bungeand J. chinensis cv. Kaizuka accounted for 82.83% and 74.67%, respectively, of the total volatiles. The relative percentage of beta-ocimene in P. chinensis was 52.44%, and the total percentage of bornyl acetate and D-limonene was 51.7%. Caryophyllene, 7-methyl-3-methylene-1, 6-octadiene, and D-limonene existed as volatiles of both P. chinensis and J. chinensis cv. Kaizuka. The peak areas were positively correlated with the concentrations of the volatiles. Under the same mass weight, the total peak area of the volatiles from P. chinensis was 1.92 times that the area of the volatiles from J. chinensis cv. Kaizuka. The peak area of caryophyllene from P. chinensis was 10.9 times that from J. chinensis cv. Kaizuka, and the peak area of 7-methyl-3-methylene-1, 6-octadiene from P. chinensis was 0.34 times that from J. chinensis cv. Kaizuka. The peak areas of D-limonene were similar for both P. chinensis and J. chinensis cv. Kaizuka. These results indicated that the types of volatile components and their relative percentages were different between the two tree species. Some volatiles, such as bornyl acetate, caryophyllene, limonene, and 2, 6-dimythyl-2, 7-octadien-6-ol, have a relaxing effect on the central nervous system, while volatiles such as 7-methyl-3-methylene-1, 6-octadiene can excite the central nervous system (Cruz-Lopez et al.2001; Ghelardini et al. 2001; Kjaer and Hesse 2001; Sun and Wang 2004; Moret et al. 2005; Wu et al. 2005; Yao and Zhang 2006; Zhou and Qian 2006). Although the volatiles of J. chinensis cv. Kaizuka contain some excitation-inducing compounds, such as 7-methyl-3-methylene-1, 6-octadiene, and the volatiles of P. chinensis contain some relaxation-inducing compounds, such as caryophyllene and limonene, the total peak area of these relaxing volatiles of J. chinensis cv. Kaizuka was 1.3 times those of P. chinensis. Fig. 2. Effects of the different tree species on the oxygen saturation of blood. for female and male participants (by 1.015% and 0.405%, respectively) after they inhaled the volatiles of P. chinensis (P < 0.05). Similarly, the OSB of the participants decreased by 0.074% and 0.492% for female and male participants, respectively, after they inhaled the volatiles of J. chinensis cv. 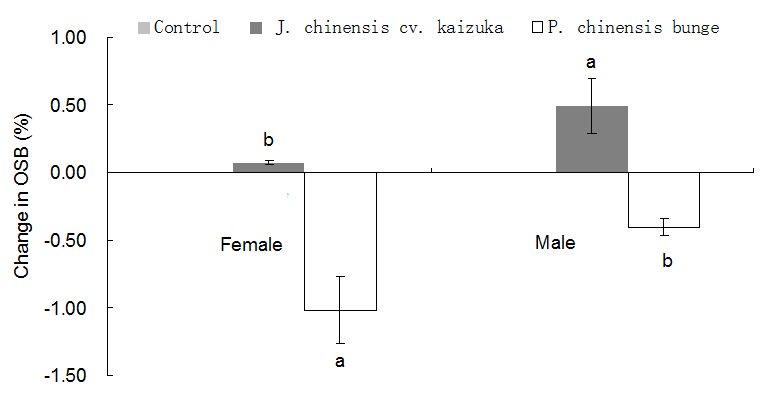 Kaizuka, and the decrease was significant for male participants (P < 0.05). These results indicated that the volatiles from P. chinensis had a negative impact on the cardiovascular system, and the impact was larger for female participants than for male participants. The volatiles from J. chinensis cv. Kaizuka had a positive impact on the cardiovascular system, and the impact was larger for male participants than for female participants. These volatiles demonstrated that they could improve the functioning of the respiratory and circulatory systems of male participants. When an individual feels tensed and excited, the blood vessels in the fingers contract (i.e., vasoconstriction), the blood flow decreases, and the finger temperature (FT) decreases. When an individual is in a state of relaxation, the opposite happens (Zhang et al. 2003a; Lou et al. 2005; Wang et al. 2010). As shown in Fig. 3, the FTs of female participants in the control group increased from 32.699 to 32.714 °C, and the FTs of male participants in the control group increased from 32.693 to 32.703 °C, indicating that they were calm in the quiet room where they had been asked to remain. In comparison to the control group, the FTs of female participants increased by 0.0141 °C after inhaling the volatiles of J. chinensis cv. Kaizuka, while the FTs decreased by 0.102 °C after they inhaled the volatiles of P. chinensis. The change was significant (P < 0.05). After inhaling the volatiles from J. chinensis cv. 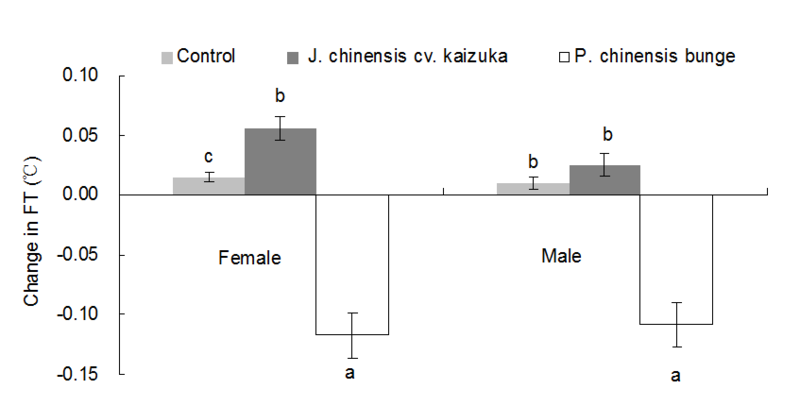 Kaizuka, the FTs of male participants increased (P > 0.05), whereas after they had inhaled the volatiles from P. chinensis, the FTs of the male participants decreased significantly (P < 0.05). The results indicated that the participants tended to feel more relaxed in an environment of J. chinensis cv. 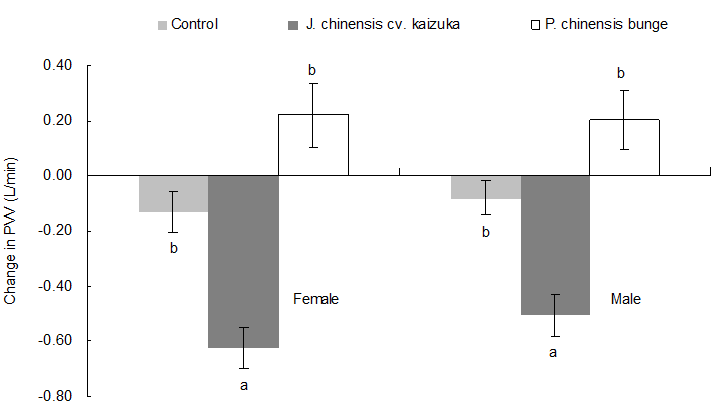 Kaizuka than they did in the fresh air environment, whereas they tended to feel more tensed and excited in an environment containing P. chinensis, and these effects were larger for female participants than for male participants. Fig. 3. Effects of the different tree species on finger temperature. Pulmonary ventilation volume (PVV) is the volume of air that is expelled from or enters the lungs in a minute. The higher the volume, the higher the absorption of oxygen. The PVV generally decreases when an individual is at rest and increases with exercise. After inhaling the fresh air and after inhaling the volatiles from P. chinensis and J. chinensis cv. Kaizuka, the breathing rates of all participants decreased. For the male participants, the rates decreased by 0.91 times per min, 2.21 times per min, and 0.82 times per min, respectively; for the female participants, the rates decreased by 1.10 per min, 2.8 per min, and 1.91 per min, respectively. This might be related to the fact that the volatiles of J. chinensis cv. Kaizuka contain 2, 6-dimethyl-2, 7-octadien-6-ol, which could help lower the breath rate and thus lower the ventilation volume after the inhalation of the fresh air and of the volatiles from J. chinensis cv. Kaizuka (Zhou et al. 1998). However, after inhaling the volatiles from P. chinensis, the PVV increased significantly (P < 0.05) (Fig. 4). After the participants inhaled the volatiles of J. chinensis cv. Kaizuka, the PVVs decreased from 7.543 L/min to 6.920 L/min for female participants and from 7.730 L/min to 7.224 L/min for male participants. However, after the inhalation of the volatiles from P. chinensis, the changes in the PVVs for both male and female participants were not obvious (P > 0.05) compared with those of the control group. However, compared with the PVVs before inhalation, the changes were significant (P < 0.05) for female participants in the control group who inhaled the fresh air and also significant for both the male and female participants who inhaled the volatiles of P. chinensis and J. chinensis cv. Kaizuka. Therefore, it can be concluded that in a quiet environment, the inhalation of fresh air and the inhalation of volatiles of J. chinensis cv. Kaizuka both have the ability to induce feelings of relaxation. Fig. 4. Effects of the different tree species on pulmonary ventilation volume. The electrocardiographic (ECG) indices include the following: heart rate, RR interval, PR interval, width of P wave, QT interval, and JT interval. One of the most important physiological indices, heart rate is defined as the number of times the heart beats in a minute. When the inner environment of the human body changes, the heart rate changes accordingly. For example, when sick, when agitated, when the body temperature is elevated, or during situations involving a lack of oxygen, exercise, or painful stimuli, the heart rate may change (Zhang et al. 2003a; Wang et al. 2010). The effects of tree species on the heart rate are shown in Table 2. The heart rate changed significantly in the environments containing the volatiles from P. chinensis and J. chinensis cv. Kaizuka. On average, heart rates increased after inhalation of volatiles from P. chinensis and decreased after inhalation of volatiles from J. chinensis cv. Kaizuka. The heart rates of female participants increased by 3.65% and decreased by 4.10%, respectively, after inhalation of volatiles from these two species, and the heart rates of male participants increased by 3.06% and decreased by 3.92%, respectively. After inhalation of the volatiles from J. chinensis cv. Kaizuka, the average heart rate decreased by 3 beats/min. The relative content of 2, 6-dimethyl-2, 7-octadien-6-ol, one of the volatiles of J. chinensis cv. Kaizuka, reached 2.894%, which might be one of the main reasons for the decreased heart rate (Zhou et al. 1998). The RR interval describes the interval of R waves in ECG. It reflects the coefficient of variation of the interval of the pulse. When the RR interval decreases, the work efficiency increases (Sun et al. 2004). Compared with both the control group and before inhalation, the RR intervals decreased after inhalation of the volatiles from P. chinensis (Table 2), but only the RR intervals of female participants decreased significantly (P<0.05). However, after inhalation of the volatiles from J. chinensis cv. Kaizuka, the RR intervals for both male and female participants increased significantly (P < 0.05). The PR interval represents the time interval between the electrical activation of the atrium and the electrical activation of ventricle. Normally, the younger someone is, the higher the heart rate would be and the shorter the PR interval would be. An increased PR interval would mean that the required time for the activation to pass the atrioventricular junction was prolonged, indicating the existence of atrioventricular conduction defect (Yao and Zhang 2006). Compared with before inhalation, the PR interval was lower after the inhalation of the volatiles from P. chinensis, but higher after the inhalation of the volatiles from J. chinensis cv. Kaizuka (Table 2). However, both PR intervals were within the normal range of 0.12 to 0.2 s, indicating that exposure to the volatiles of either species was not leading to atrioventricular conduction defect. The widths of the P waves measured before and after the inhalation of the volatiles from the two tree species were all shorter than 0.11 s (Table 2); the difference, however, was not significant (P > 0.05), indicating that the effects of the volatiles on the depolarization of the two atria were not obvious. The QT interval is the required time for ventricular depolarization and ventricular repolarization, that is, the required time for an electric systole of the ventricle. It is closely related to the heart rate. Usually, the higher the heart rate is, the shorter the QT interval would be (Wang et al. 2010). The prolongation of the QT interval is an independent index used to predict renal failure in patients with chronic heart failure and high occurrence rate of the sudden cardiac death (Kjaer and Hesse 2001). The index involves a simple and noninvasive testing procedure. An unusual QT interval may predict the occurrence of heart attack (Cheng and Lou 2013). After inhaling the volatiles from J. chinensis cv. Kaizuka, the QT interval increased (2.37% for female participants and 1.46% for male participants, respectively). However, after inhalation of the volatiles from P. chinensis, no significant change (P > 0.05) was observed within the QT interval compared with the control group and compared with before inhalation (Table 2). Compared with the control group, there was no significant difference (P > 0.05) in the QT and JT intervals before and after the inhalation of the volatiles from the two tree species. All the QT and JT intervals were within the normal ranges, indicating that the inhalation of those volatiles should not result in malfunction of the repolarization process of the cardiac muscle cells (Lou et al. 2005). Table 3 summarized the changes of the human physiological indices and the effects of the volatiles from different tree species. Although the volatiles from P. chinensis are capable of inducing feelings of tenseness and excitation, it is a rare tree species with colorful, beautiful leaves (Liu et al. 2012). Normally, it can be mix-planted with other trees. When planted in a crowded area, the branching points of these trees could be set higher than usual, far away from the normal inhalation range. As the volatiles from J. chinensis cv. Kaizuka have been shown to have positive physiological and psychological effects, these trees should be planted in crowded places. A survey of participants of the study showed that 80% did not like the smell of the leaves of P. chinensis, but only 9% of the participants did not like the smell of the leaves of J. chinensis cv. Kaizuka. Therefore, a question arose: were the changes in the physiological indices caused directly by the inhalation of the volatiles from the trees or were they mediated by the subjective appraisal of the smells by the participants? To answer this question, further research is needed. Certain human physiological indices differed depending on whether participants in the study were exposed to environments containing fresh air or to volatile components from P. chinensisBunge or J. chinensis cv. Kaizuka. After inhaling the volatiles from P. chinensis Bunge, the OSB and FT decreased, but the heart rate and RR interval increased. In contrast, after inhalation of the volatiles from J. chinensis cv. Kaizuka, the opposite reactions occurred. The PR interval, QT interval, width of the P wave, and JT interval indices were within normal ranges, indicating that the inhalation of the volatiles from those two tree species did not severely affect the depolarization and repolarization processes of the atrium and ventricle. The volatiles from J. chinensis cv. Kaizuka have the potential to help create a refreshing and natural environment and make people feel calm and relaxed, while the volatiles from P. chinensis Bunge have the potential to make people feel tensed and excited. The authors are very grateful for financial support from the Forestry Industry Research Special Funds for Public Welfare Projects (Project No. 20140430108), the National Natural Science Foundation of China (Project No. 31171662), and the Special Research Fund for the Doctoral Program of Higher Education (Project No. 20133702110007). This paper was also supported by CFERN & GENE Award Funds on Ecological Paper. Buchbauer, G. (1996). “Methods in aromatherapy research,” Perf. Flav. 21(3), 31-36. Cheng, J., and Luo, A. H. (2013). “Thrombolysis in acute myocardial infarction before and after treatment between the QT and JT phase discrete degree and ventricular arrhythmia,” Jilin Medical 34(17), 3396-3397. Cruz-Lopez, L., Jimenez-Zuniga, J. A., Santiesteban-Hemandez, A., and Virgen-Sanchez, A. (2001). “Response of Epitragus sallaei(Champion) (Coleoptera: Tenebrionidae) to the odor of Mangifera indica flowers,” Southwest. Entomol. 26(2), 165-170. Fang, C., Wang, C., Guo, E. G., and Qie, G. F. (2010). “Relationship between recreation in suburban forest park and tourists’ physiological health: A case Study of Baiwang Mountain Forest Park, Beijing,” J. Northeast Forest. Univ. 38(3), 86-88. Kazuhiko, S. (2000). “Odor in forest and its physiological effects,” Aroma Res. 1(3), 67-71. Kumie, S. (2000). “The influence of aromatherapy on mood,” Aroma Res. 1(1), 50-54. Seiichi, I. (2000). “Aromachological effects of volatile compounds in forest,” Aroma Res. 1(4), 15-21. Sun, Q. X., Peng, Z. H., and Zhang, Q. S. (2004). “Volatiles of wood of Chinese Fir in nature and its effect on human health,” J. Anhui Agr. Univ. 31(2), 158-163. Wu, X. S., Xiao, F., Zhang, Z. D., Li, X. G., and Xu, Z. X. (2005). “Research on the analgesic effect and mechanism of bornyl acetate in volatile oil from Amomum villosum,” J. Chin. Med. Mater. 28(6), 505-507. Yao, H. E., and Zhang, Y. Q. (2006). Diagnostics Fundament, People’s Physical Education Press, Beijing. Yatagai, M. (2000). “Tree aroma and its function of relaxation and rest,” Aroma Res. 1(1), 2-7. Zhang, X. G., Yan, K. L., Wang, L., Wu, J., and Wang, H. M. (2003). “Abdominal breathing preliminary discussion of the effect on skin temperature,” Psychol. Sci. 26(5), 941-942. Zhou, B. J., Tang, Y. H., and Li, R. (1998). “Effects of linlool on normal bodies’ cardio-pulmonary functions,” Pharm. Clinics Chin. Mater. Med. 14(3), 40-44. Zhou, C. L., and Qian, Z. Y. (2006). “Inhibitory effect of β-caryophyllenol on airway inflammation and elimination OFR of asthmatic models in Guinea pigs,” Pharm. Biotechnol. 13(5), 373-376. DOI: 1005- 8915(2006)05-0373-04. Article submitted: June 12, 2014; Peer review completed: September 1, 2014; Revised version received and accepted: September 12, 2014; Published: September 19, 2014.